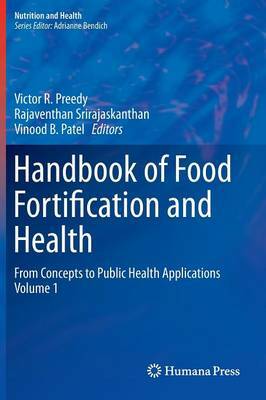 Handbook of Food Fortification and Health: From Concepts to Public Health Applications Volume 1 represents a multidisciplinary approach to food fortification. This book aims to disseminate important material pertaining to the fortification of foods from strategic initiatives to public health applications. Optimal nutritional intake is an essential component of health and wellbeing. Unfortunately situations arise on a local or national scale when nutrient supply or intake is deemed to be suboptimal. As a consequence, ill health occurs affecting individual organs or causing premature death. In terms of public health, malnutrition due to micronutrient deficiency can be quite profound imposing economic and social burdens on individuals and whole communities. This comprehensive text examines the broad spectrum of food fortification in all its manifestations. Coverage includes sections on definitions of fortifications, fortified foods, beverages and nutrients, fortifications with micronutrients, biofortification, impact on individuals, public health concepts and issues, and selective methods and food chemistry. Handbook of Food Fortification and Health: From Concepts to Public Health Applications Volume 1 is an indispensable text designed for nutritionists, dietitians, clinicians and health related professionals.